The importance of having firewalls! Firewall is a software or hardware device that protects your computer from being attacked over the internet by hackers, viruses, and worms. This may occur either at a large corporate network, or simply at a small home network; both have the same security issues. Count on Techsonduty for all your Network Security, Firewall Installations, Servers, Router Install Long Island. Networks can come in many different shapes and sizes. At techsonduty no network is too big or small. We do it all from setting up wireless home routers to business networks. We have the knowledge and expertise to make sure your network is fast and secure. We can network anything from computers to phones. Wired/Wireless routers, network switches, security firewalls and more. File Sharing: The major advantage of a computer network is that is allows file sharing and remote file access. A person sitting at one workstation of a network can easily see the files present on the other workstation, provided he is authorized to do so. It saves the time which is wasted in copying a file from one system to another, by using a storage device. In addition to that, many people can access or update the information stored in a database, making it up-to-date and accurate. A network is two or more computers connected together to share information and files between them. Businesses aren’t the only ones that can benefit from creating a network. Home users can enjoy sharing music, movies and printers from any computer. Sharing media between computers is easy when connected to a network. Like file sharing, computers can stream musing, videos and movies from one computer to the next. A media center server can store your entire entertainment library on a centralized hub to give quick access to your media from every computer on your network. Console and PC gamers benefit from networking also. You can easily set up multiplayer death matches and even host your own game server. Resource Sharing: Resource sharing is also an important benefit of a computer network. For example, if there are four people in a family, each having their own computer, they will require four modems (for the Internet connection) and four printers, if they want to use the resources at the same time. A computer network, on the other hand, provides a cheaper alternative by the provision of resource sharing. In this way, all the four computers can be interconnected, using a network, and just one modem and printer can efficiently provide the services to all four members. The facility of shared folders can also be availed by family members. Increased Storage Capacity: As there is more than one computer on a network which can easily share files, the issue of storage capacity gets resolved to a great extent. 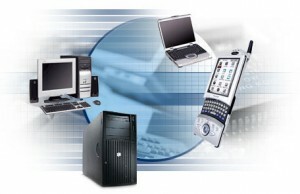 A standalone computer might fall short of storage memory, but when many computers are on a network, memory of different computers can be used in such case. One can also design a storage server on the network in order to have a huge storage capacity. Additionally, our computer network installation services are complemented by quick turnaround times. From the minute you turn to us for help setting up a new network to the minute that we leave your office, we’re confident that you will be amazed with the efficiency of our technicians. As a locally owned and operated company, we realize that our clients are the reason for our success. Due to this, we will do everything we can to exceed your expectations when you let us help with your computer network installation project. If you’d like to get the installation process started, please don’t hesitate to reach out to us at Techsonduty today. We are eager to earn your business and will strive for perfection when we set up a new computer network on your property. Before we install CAT-5 data wiring at your location we will first assess your existing and future network requirements. Because setting up a wireless network requires an understanding of the systems that will make up that network, using computer diagnostics on each system before you begin is smart. For example, do you know the specifications for each computer? While it’s not overly difficult to manually inventory each computer, computer diagnostic software can do it for you automatically with just a click of a button. Once an inventory has been generated for each computer, you can then print your inventories out and quickly see potential problems. For example, you might realize that some of the computers run Windows XP while others run Windows Vista, Windows 7, or even Macintosh. You may also notice that some computers have wireless network adapters while others do not. You may even discover that some of the older network adapters do not support the wireless standard that your new wireless network will be running on. Armed with this knowledge, you can prepare for the network set up. You may need to run down to the computer shop and buy a few wireless adapters. You may want to upgrade the operating systems of a few of the PCs to ensure compatibility. By running computer repair software beforehand, you can make these decisions and adjustments before setting up the network. Once you’ve run the diagnostic computer repair software and know what you’re dealing with, you can then start planning the network design. You’ll need a wireless network router and compatible wireless network adapters for each computer. The router physically connects to your broadband Internet connection, so place it near your cable modem or DSL outlet. Initially, you will need to connect a computer to the router using a cable in order to configure the network. This is temporary. Once the network is set up, you can untether the computer and work wirelessly from that point forward. During the configuration process, you’ll use Internet Explorer to access the router. Use the documentation that came with your router for the specific address and password. For example, if you have a Linksys router, you’ll enter “http://192.168.1.1” into Internet Express’s address bar and use the username of “admin” and the password of “admin” in order to access the router’s configuration interface. While the specific steps will vary, the process is similar. You’ll need to give your wireless network a name in the SSID field, choose an encryption type and passphrase, and set an administrative password. Once the basic configuration has been set up, the next step is to connect the computers to the network. Assuming the network adapters have been installed and are turned on, turn on each computer and connect each one to the network individually. Do this by going to Start > Connect To and then selecting the network from the list. You’ll be prompted to enter the passphrase you specified earlier. That’s it. Your network has been set up. If any of the computers have problems connecting to the new wireless network, check to make sure that their network adapters are turned on and consider using computer diagnostics to rule out problems with the wireless network adapter.